Southern California’s legendary Santa Ana winds wreak havoc every year, creating hot, dry conditions and fire hazards. This image was produced using data from the SeaWinds instrument aboard NASA’s Quick Scatterometer (QuikSCAT) spacecraft. 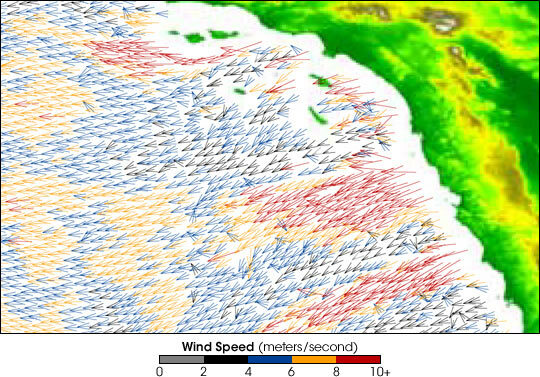 The image shows strong winds blowing offshore all along the Southern California coast. The fastest winds are indicated in red, with orange, blue, black, and gray representing progressively slower wind speeds. Despite their ominous nickname—Devil Winds—the winds have some positive benefits. “These strong winds, which blow from the land out into the ocean, cause cold water to rise from the bottom of the ocean to the top, bringing with it many nutrients that ultimately benefit local fisheries,” said Dr. Timothy Liu, a senior research scientist at NASA’s Jet Propulsion Laboratory, Pasadena, Calif., and QuikSCAT project scientist. Liu and Dr. Hua Hu of the California Institute of Technology, Pasadena studied satellite observations of the Santa Ana effects on the ocean during three windy days in February 2003. QuikSCAT was able to identify the fine features of the coastal Santa Ana wind jets. It identified location, strength, and extent—a significant improvement over weather prediction products and moored ocean buoys, which lack sufficient resolution (weather products) and spatial coverage (buoys) to fully document the events.